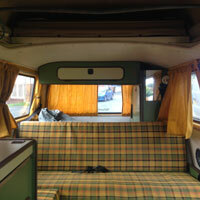 1982 - 1990 Volkswagen Watercooled T25 / T3 Westfalia Continental / Westfalia Joker Right Hand Drive History. 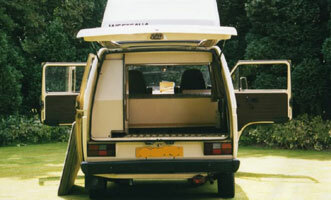 The vast majority of VW T25 / T3 / Vanagon campers were built for either the European, USA or Canadian market and were built in left hand drive (LHD) configuration. There has been much talk in the VW world about whether any right hand drive (RHD) Westfalia models were produced for the UK market. 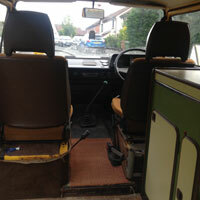 A few RHD vans with Westfalia furniture had been advertised for sale but were usually dismissed as being RHD vans that had been retrofitted with either the interior from a LHD van or with furniture from the Westfalia Mosaik range. However further research has unearthed some magazine reviews and a brochure and price list to prove that a few examples of RHD VW T25 / T3 Westfalia models were sold via UK based import company Travelworld based in Wolverhampton and then later on by Sterling Trailers based in Devon. The early models were called VW T25 Westfalia Continental (not to be confused with VW T2 Bay window models of the same name). 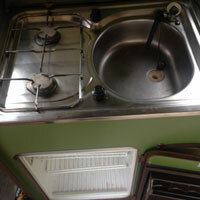 According to the 1982 National Motor Caravan Fair Show report (see downloads below) it was possible to buy in six different layout configurations. 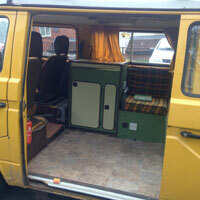 The prototypes at the show were built from panel vans and whilst having a high specification it was stated that there was room for improvement to the trim and upholstery. Travelworld stated that future imports would be built on the “Kombi” version with improved trim. The price was stated to be very competitive at £8,698 with the 2.0 litre aircooled engine which was up to £1000 cheaper than similar specification British models. By the 1983 Caravan Camping Holiday show the standard of trim had been greatly improved and the VW T3 Westfalia Continental had a competitive starting price of £8,237 with the 1.6 litre watercooled engine. 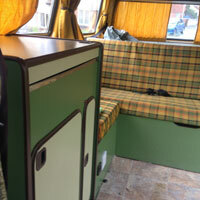 Furniture in the early models was in an attractive green colour officially called Forest Glen and was made from a strong and lightweight patented plywood/cork laminate at a time when British convertors were using chipboard. At some point Westfalia / Travelworld dropped the name Westfalia Continental in favour of the European name Westfalia Joker as can be seen in the 1984 Travelworld RHD Westfalia Joker Sales Brochure and Pricelist in the downloads below. 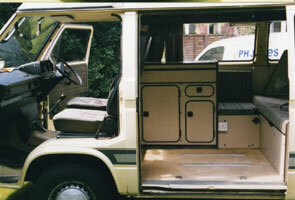 The furniture used in the later versions was the beige with brown edging as in the standard Westfalia Joker of this era. And then I believe that around May 1987 Sterling Trailers took over as the UK’s Westfalia Camper Agent with a stand at the Motor Caravan Fair at Billing Aquadrome showing off two complete vans as well as kits to fit to your own van (see download of adverts at the end of this page).